I was so proud of this wreath when I finished it that I emailed a photo to my mom right away. She’s great with wreaths, but I’m usually not very good at them. 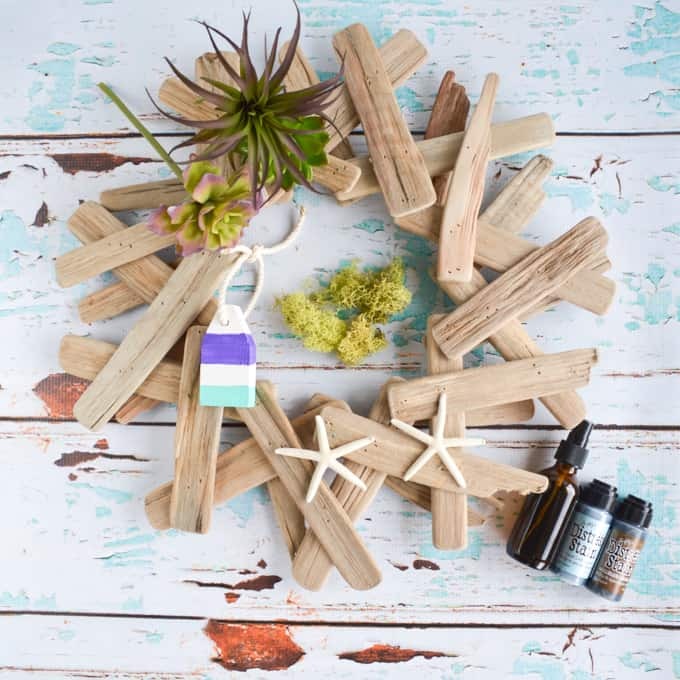 These materials really spoke to me, though; as soon as I saw the “driftwood” wreath bases at the craft store, I knew I had to buy one! I went to the store for some stickers, but left with a bag full of moss, fake succulents, and a bunch of wood. That’s what happens when you go craft shopping while your husband is away! The funny thing is, we can’t even hang a wreath on our door. It’s hanging on an interior wall, high up and behind a statue of David on top of an ornate cast pillar featuring flowering vines and two horses. 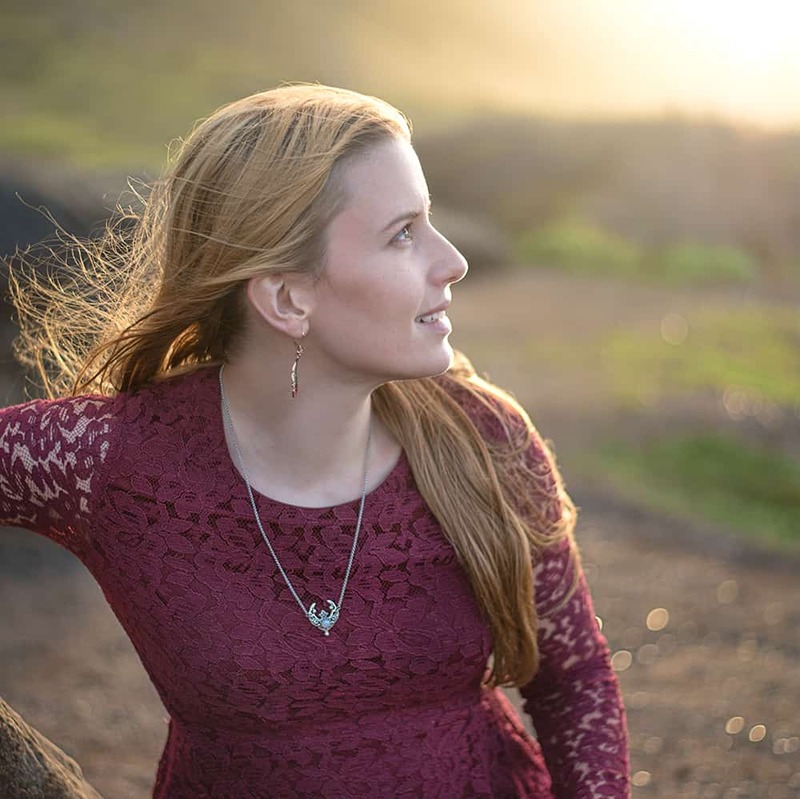 Don’t ask me – they’re both pre-marital property on my husband’s side. 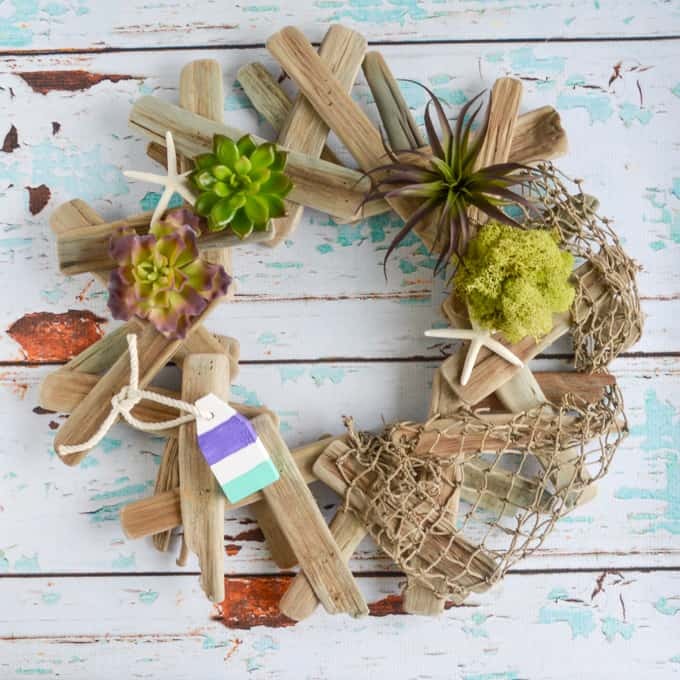 You can obviously use whatever nautical/beachy decor accents you like on your wreath – it doesn’t need to be exactly like mine. 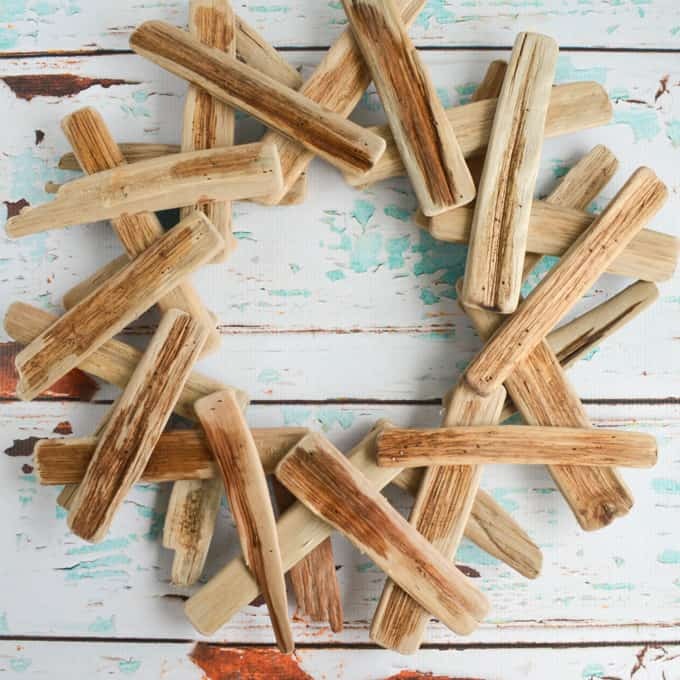 This tutorial is mostly for inspiration with some tips and tricks on how to make your faux driftwood wreath look a little more like real driftwood. I used to paint a lot of miniatures (tabletop gaming pieces, not tiny portraits! ), so I applied some of the same principles to this project in order to create a slightly more weathered looking wreath. 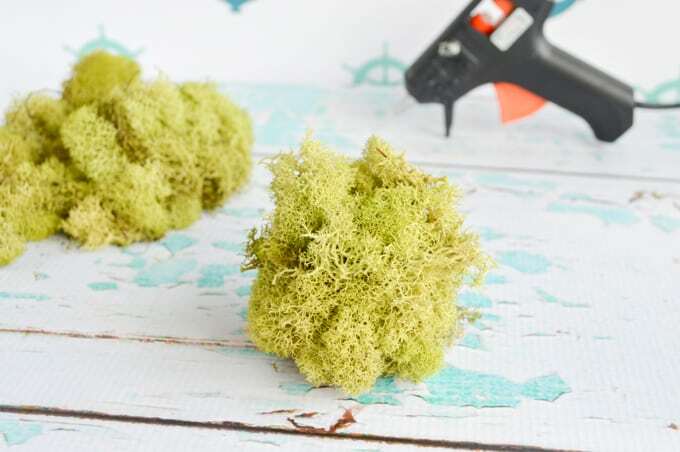 Also, I figured out a way to make your own “moss balls” (is there a better name for them I’m not aware of?) for your wreath. The package of moss I got cost nearly $8, and a bag of half a dozen moss balls was an additional $12! I decided to pass on the moss balls and figured out how to make them for myself. Now I have a lot of leftover moss to use for a future project, which seems a lot more versatile than additional balls of moss. A glass spritzer bottle – don’t use plastic unless you want to ruin it for any other use in the future! I know you’re wondering why in the world I have Future floor polish on that list! Well, let me tell you. I wanted to get some darker brown stain down into the cracks and crevices of the wood. The wood on my wreath, just like real driftwood, is pretty dry and thirsty, which makes the stain sink in. That’s good, but I wanted to encourage the stain to really pool down into those cracks instead of hanging out on the flat surfaces. In miniature and model painting, you make what’s called a “magic wash” to pull dark paint down into the cracks and make all the detail pop using Future floor polish because it helps break the surface tension. Plus, it’s fairly heavy and really designed to get in those crack. Both these things help the paint mixture sink down in! If you don’t have any Future (or Pledge with Future or whatever they’re calling it now), you can also try Mop and Glo. If you don’t have either, I wouldn’t stress and rush out to buy a bottle! If you do have it, though, you might be surprised by how it can impact your craft painting! 1. Press some of the darker Distress Stain out into a plastic tray. You can press the sponge down repeatedly to get some out, or remove the sponge dauber top with a pair of pliers and pour some out. 2. Add water to lighten the color, if desired. I went about 50/50 stain/water. Lastly, add in a small squirt of floor polish. 3. Using a flat brush, paint the stain on your wreath. I mostly painted in the middle sections, making sure to get extra down inside the cracks. 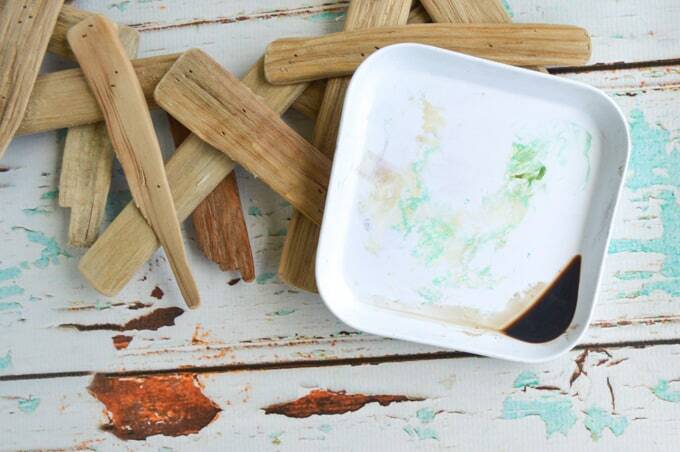 Don’t forget about that back layer of wood – make sure to stain it, too! It will look really dark when the stain is wet, but it will sink in, dry up, and lighten, so don’t worry. See, look how much lighter it is a few minutes later. 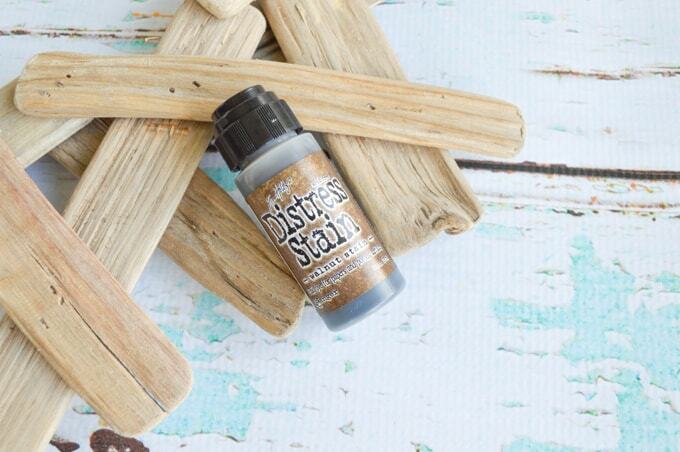 You might even decide to add a second coat of stain before moving on! 4. Once you’re happy with the “shadows” on your wreath, it’s time to add some additional flavor with the second Distress Stain. I used Tumbled Glass, which is blue. Green would look nice, too. Using a pair of flat-nosed pliers, a paper towel, and caution, pull the top off the bottle of stain. Don’t try to pull the sponge out – that will ruin the bottle for its intended purpose. Grab hold at the bottom of the black plastic base, instead. 5. Pour a little of the stain into your glass spritzer bottle. You can water if down, but I used mine straight. 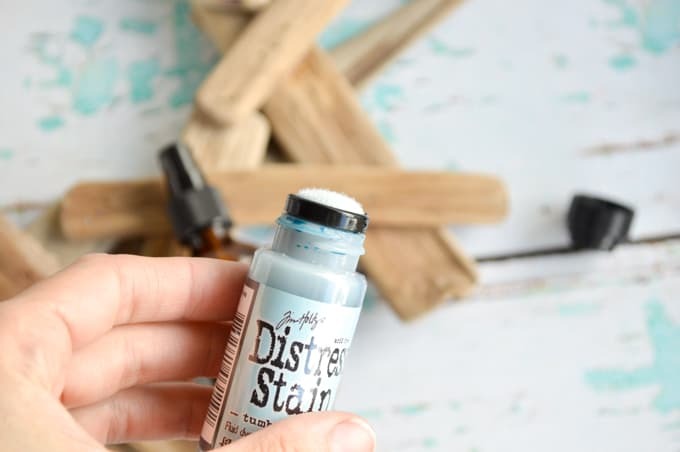 Once your stains are dry, you’re ready to get decorating! This part is pretty easy! 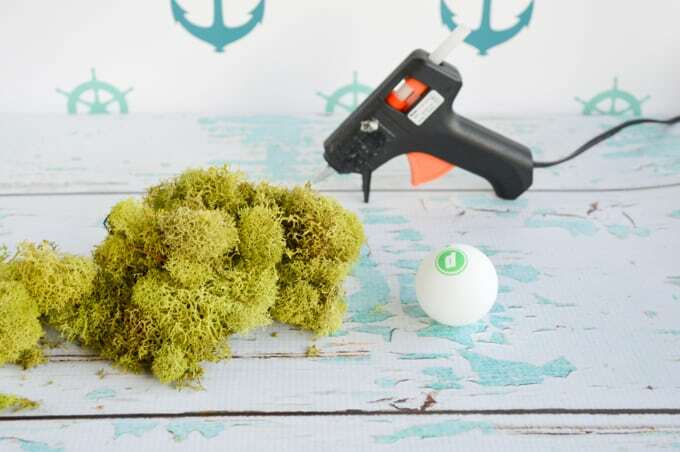 Grab some craft moss and a ping pong ball, then heat up your hot glue gun. Add some hot glue to the ball and press on a clump of moss. Keep adding glue and moss (and more glue, as needed!) until the ball is covered and you’re happy. Done! 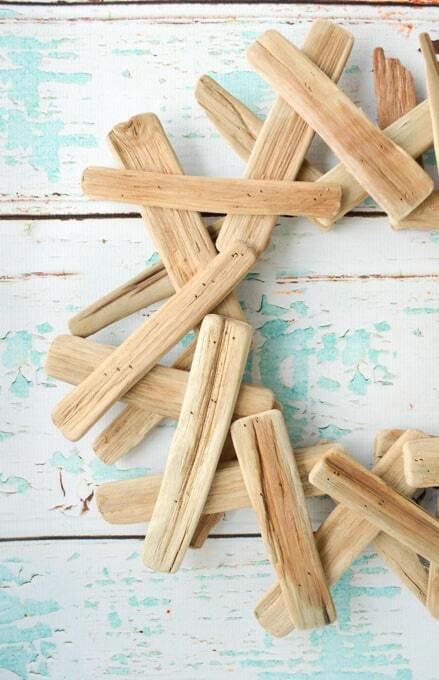 – You’ll probably need to trim down stems on the faux succulents a lot. I’ve found that the pliers on a Leatherman multitool work really well for this! – Remember that design elements usually look nice when there are an odd number of them. There are either 1 or 3 of everything on my wreath – no 2s or 4s! 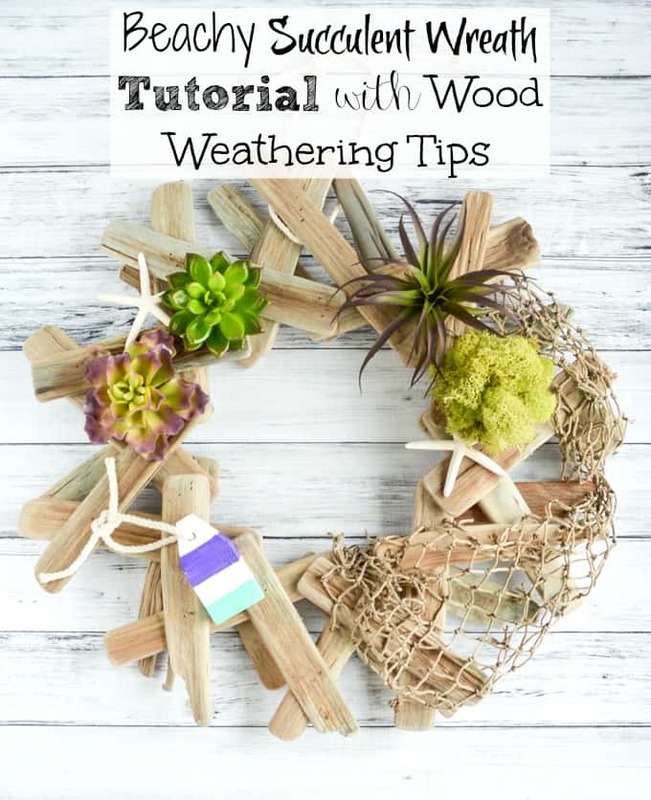 – Place everything on your wreath and move it around until you’re happy with it all before you glue anything down. – Make gluing fishing net easy by dabbing a little hot glue on the back of individual knotted joins. This way the netting stays in place without having hot glue visible absolutely everywhere! 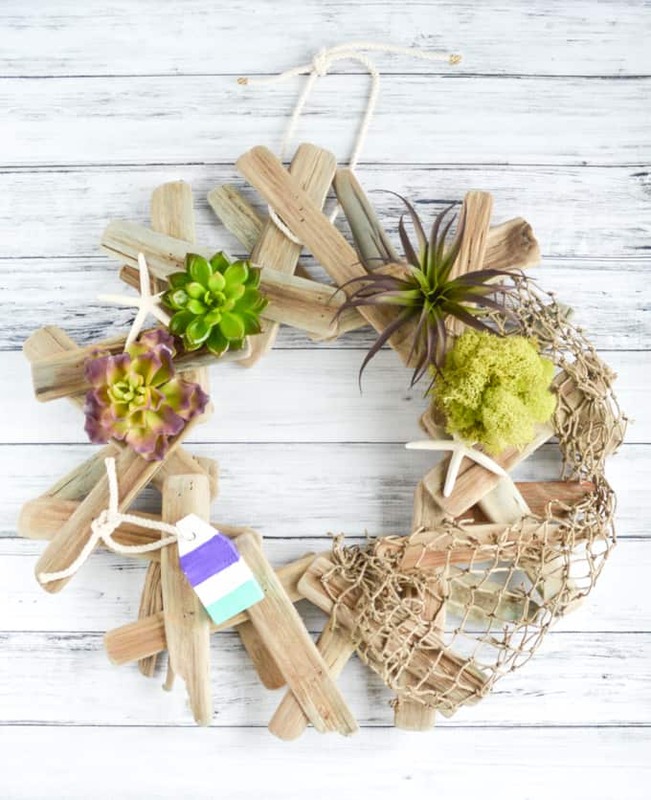 Once everything is glued in place, your wreath is ready to hang! I suggest a nautical piece of rope. Very cute. Are you a wreath person? 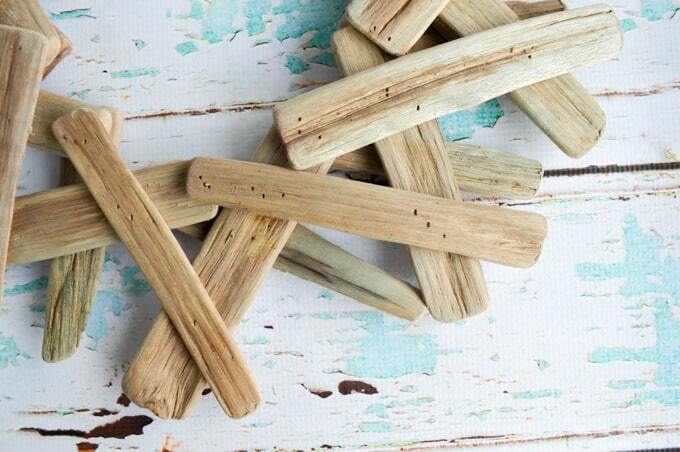 Do you hang them on the door, or have you also hung one inside? WOW, this looks awesome…especially love the succulents!